Abstract: Inland waterway transport plays an important role for the transport of goods in Europe. More than 37,000 kilometers of waterways connect hundreds of cities and industrial regions. 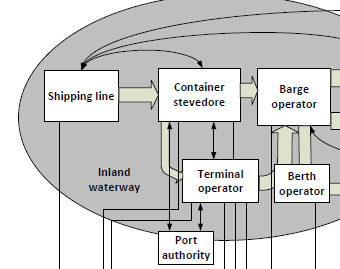 Compared with other modes of transport which are often confronted with congestion and capacity problems, inland waterway transport is characterized by its reliability, low environmental impact and its major capacity for increased exploitation. The European Commission aims to promote and strengthen the competitive position of the inland waterway transport in the transport system and to facilitate its integration into the intermodal logistic chain. Thus, inland waterway transport will be a promising research issue in the near future. The objective of this paper is to review the current status of research on inland waterway transport at a tactical planning level. This paper firstly describes the characteristics and relevant activities involved in this transport mode and then reviews the literature published recently. Finally, this paper presents some perspectives regarding future research directions in the field of inland waterway transport. Reference: S. Li, R.R. Negenborn, G. Lodewijks. Survey on planning problems in inland waterway transport: Current status and future perspectives. In Proceedings of the 16th International IEEE Conference on Intelligent Transportation Systems (IEEE ITSC 2013), The Hague, The Netherlands, pp. 1231-1237, October 2013.